The Bangalore Chapter of The Indian National Trust for Art and Cultural Heritage (INTACH) has put out a free walking-tour app of the city’s heritage sites. The app is available for both iOS (iPhone, iPod touch and iPad) and Android mobile phones. We downloaded the app for our iPhone a short while ago. Available in both English and Kannada, the app covers the area around Tippu’s Fort, not far from K.R.Market in Bangalore. Besides text and pictures, the app also has audio commentary in both English and Kannada for a few sites. While not the greatest of designs, the app could be of some use to tourists in Bangalore. 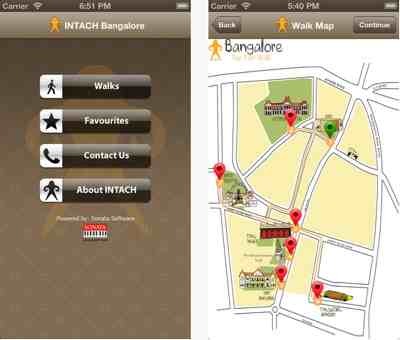 The INTACH Bangalore app was developed in partnership with Bangalore-based IT firm Sonata Software.